The Easter Bunny is getting prepared for the Easter season! He’s packing his basket, collecting eggs and getting his map ready to go. Are your little ones excited for the Easter Bunny’s arrival? 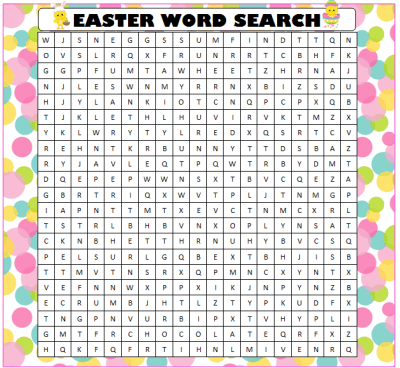 This free printable Easter Word Search For Kids reveals a special surprise picture once complete. Have your child color in the squares for each word found. At the end, he’ll find that the found words are in the outline of the Easter Bunny! It’s a fun & quiet activity idea leading up to the exciting Easter festivities. It’s also a great activity to keep the kids busy while you’re preparing the delicious Easter meal. What other words would you use to describe Easter? Does your family have any fun Easter traditions? So far we have a special plate that we set out and top with carrots so that the Easter Bunny can take a little carrot break at our house. For more Easter fun, visit our Holiday Fun page and scroll down to the Easter section for loads of free printable games, activity ideas, Easter Party ideas including ideas for decor, activities, food, favors and more! Easter is one of the biggest holidays on Moms & Munchkins because we have so many creative ideas for celebrating with your family. For more free printable games, check out our Free Printable Games page where we have loads of word searches, scavenger hunts, charades, BINGO cards and more! To stay updated on the latest ideas and freebies, follow along on Facebook, Pinterest, Twitter or through our new Bloglovin’ RSS feed. Thanks for joining Flock Together this week. I am now your happy G+ follower.